The BBC has confirmed that David Tennant's tenth Doctor Who will meet Peter Davison's fifth incarnation of the Time Lord for a Children in Need special on Friday, 16 November. Peter Davison (left) and David Tennant. Details are thin on the ground, apart from the fact the scene is called Time Crash, and was penned by Steven Moffat, as previously rumoured. 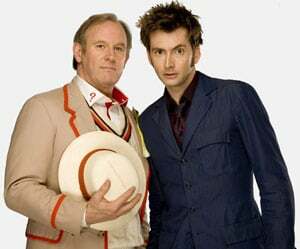 Davison enthused: "It is an honour for me to be able to make the connection between the fifth Doctor and the tenth Doctor. However, now is not the time for sound-bites. I can feel the hand of history on my shoulder, even if I can't do the buttons up." The news will doubtless cheer Who fans after the revelation back in September that although there will be a series five of the time-traveller, it won't be until 2010 and and David Tennant is doubtful to reprise his role. Tennant is off to play Hamlet with the Royal Shakespeare Company from July to November next year, which means no full series for 2009, although he will appear in three specials during the year.